Yeah, my crits table is all "drop a weapon, fall down, get knocked back, get stunned" kind of stuff. There is one double damage effect but it only happens 1/18 times. One caution though: crit on 20 is a lot easier to remember in action than the 5 point rule. I'd rather reduce the crit chance than have a no effect result on the table. Kind of an anticlimax. I've never liked the 'natural 20' critical in D&D for the same reason that you are uneasy - the clumsiest Goblin will roll a critical hit as often as will Conan. 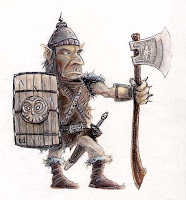 I think you're right to make criticals in some way dependent on fighting ability - in RuneQuest and related games it is usually some percentile (usually 5, 10, or 20%) of the skill that the character is trying to roll under. In simple games such as OpenQuest, the result of a critical is simply maximised damage. In more complex versions, achieving a critical has quite colorful effects - either an effect based on the type of weapon (slashing, peircing, crushing, say), or, in Mongoose RuneQuest II/Legend, the choice of a whole range of interesting 'combat manoeuvres'. I think this somewhat depends on what you are defining a critical hit to represent. If a critical hit is a skillful exploitation of an enemy opening, then five above what is required to hit seems right. But if a critical hit is trying to represent a "lucky" hit - the bad guy accidentally impaling himself on the trembling farmer's dagger - then an arbitrary number is a better mechanic. Long ago, in the before times (AD&D 2e era, somewhere in the mid-90s) I had a similar idea but easier to apply implementation. 20: automatically hit. If it would have been a miss except for this rule, you do half damage. 16-19: normal hit or miss. I don't remember exactly what '1' was because I don't think it ever came up. Mathematically this is very similar to what you're describing. 20: automatically hit; half damage if you would have missed without this rule. I turned the effects up a little, and narrowed the ranges slightly from my previous table. In this model a critical doesn't necessarily mean that you hit the current target better (which is what bonus damage indicates) but that you are able to put yourself in a really good position. I also dropped the fumble entry (automatic miss). In AD&D and D&D 3.x the higher your BAB the more attacks you have, and thus the more opportunities to fumble... which seems lame. Automatic hit on a 20 is throwing a bone to the utterly outclassed (and because I halve damage in that case it's a small bone), but if you can hit on a 1 you so outclass your opponent you deserve it. Let it happen. Longer treatment at Response to "Some Thoughts on Criticals -- Curving the Scores"